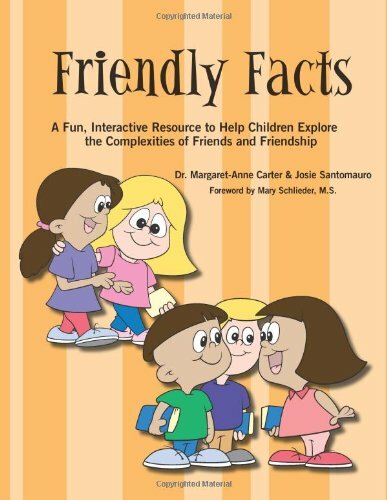 Friendly Facts A Fun, Interactive Resource to Help Children Explore the Complexities of Friends and Friendship by Margaret-Anne Carter and Josie Santomauro. This interactive workbook is aimed at children ages 7-11, a period when friendships are increasingly important and a lack of friendship skills is all the more obvious and challenging. Friendly Facts explores five themes: What Is a Friend?, Being a Friend, Making Friends, Real Friends, and Staying Friends. Through fun activities that appeal to today’s youth, children explore and put to a real-life test the major tenets of making and keeping friends. As such, this book prepares them for successfully participating in human interactions for the rest of their lives.